A two-day, hands-on workshop to align your current marketing efforts to that of a digital content approach. Make use of trends and techniques to push your brand to a wider audience to meet corporate targets – whether increasing revenue, promoting engagement, or becoming a market leader. Companies with existing marketing teams but need extra help with updating strategy, branding, and employing/implementing latest tech tools and platforms to meet company goals -- whether increasing revenue, improving branding, or becoming a market leader. Organizations with heavy advertising budgets but unable to deliver desired results or are looking for other channels to optimize results or expand in new markets. Organizations who are planning to set up a marketing/sales structure or optimize revenue management activities. 7,500 Php includes 50% Launch Discount. Limited Seats! * Groups of 2 or more get additional 5% discount. Subject to availability. First Come, First Served. 1. Have an understanding of the value of creating customer-centric content by learning practical ways to use stories in the content you create. 2. Learn how asking the right questions can lead you to authentic brand stories that your audience can connect to. 3. Learn how you can transform your existing marketing team to content generators and find ways how to build engagement through conversational content. 5. 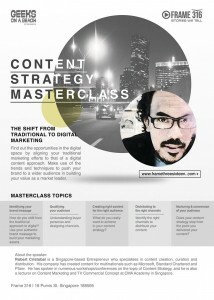 Discover the work involved in having a content strategy in place and how you can manage the results of this strategy. 6. Design a content structure that you can use to start building your content assets for your company. Yes, you have a company that sells this awesome product or provides the most valuable services. But guess what, you are not alone in this part of the planet. In this tract, you will learn how your authentic voice and your story can help you deliver a unique message to your target audience. Understanding buyer personas and designing a channel to use these personas to influence your marketing team to use the right strategy and lead your sales team to the people who are ready to buy from you. Define your purpose in creating the content, what do you really intend to accomplish through your content strategy and why a one size fits all approach will not deliver the results you were expecting to get. So you got your content nailed, you think the message is clear, you are not hard selling, and the value of the right combination of a compelling content that is entertaining is already up your sleeve. Now, what do you do with that amount of content? In this tract, you will learn how to identify the right channels for your specific message delivered at the time when your customers need it. Lastly, your audience has decided to acquire or purchase from you, while you have done most of the job by this part you have to remember that the rest of the marketing world will try to create content to steal your audience. What do you do to keep them going back to you for repeat business? It still has a lot to do with content. Robert Cristobal is a Singapore-based Entrepreneur who specializes in content creation, curation and distribution. HIs company has created content for multinationals such as Microsoft, Standard Chartered and Pfizer. He has spoken in numerous workshops / conferences on the topic of Content Strategy, and he is also a lecturer on Content Marketing and TV Commercial Concept at CMA Academy in Singapore.